So, what did you buy from Kinguin and who was the seller? I've never had a revoked key from them. That's probably due to sticking to sellers with a positive rating and this won't happen. People have bought keys from Game that were duds, so, with your logic you should stop using Game! Yup... it is, I and many others have had keys cancelled by Steam (stolen) and also received keys which had already been used. I'd prefer to pay more and avoid any risk..... I'm sure some would prefer to take the risk to obtain cheaper keys, they have a choice, as we all do. How will I ever remember though? Street Fighter (5 at least) is dead to me. Tired of buying half a game and having to grind like hell or pay more to unlock things. I loved Street Fighter but hate what they have done with this. "Sure you're Ken" (lol) "Takes nothing to realise you're Ken"
I'll add this on but here's a link to a little merch sale: Click me! You don't know which website he bought it from do you? And how much it cost? I think OP is joking. The European version plays at 50 hz whilst the game is supposed to be played at 60 hz. I think the USA version may run at 60 hz. I play this on emulator or original DC hardware, so doesn't really speak, even though I purchased it long ago. Edit - just to add, if you are casual player of beat em ups then I guess this would suffice. If you know you fighters and or play competitively then you will not like this version. I still vote hot as the price is good. Don't see why people are saying it's a terrible port as its the PS2 version running on the PS3. Both plays fine to me. Heat.... Least I am in this game! Of Course! Your here ain't you! Only kidding. That's the Nintendo tax! &#x1F62C; But I love my switch! £34.99 rrp? Do they think switch owners are a special breed of stupid? Sold mine on gumtree recently for £20. Keep looking on there and you might get lucky. 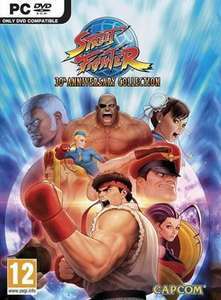 Cold, wait for the Sister Street Fighter Hyper Mega Alpha Final Strike Zero Arcade Collection instead. 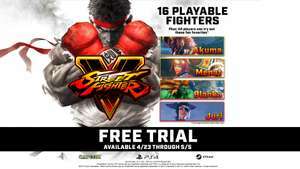 Never miss a 'Street Fighter' deal again! No unfortunately you cannot buy Ultra SFIV separately on Xbox, only available separately on PS4/PC, or as DLC for the Arcade Edition on Xbox, no idea why this is. The 8bitdo seem like they have the same enclosure as the venom, layout and design is the same. Still rocking a Street Fighter X Tekken V.S. (Sanwa stick &amp; buttons). What a beast, possibly the best £60 I've ever spent! Isn't that the full game? Or really just the upgrade for Super SF? It’s a shame Capcom never seem to put the Ace Attorney DLC on sale too. Didnt realise this was back in stock! Ordered as missed out last time, Thanks OP! If you're still for it, It's priced back now. This needs expiring. Jumped back up to £25.39 and it’s OOS too. I want this price or ideally £10 for PS4 version. until then. We didn’t have good graphics back in the day it was all about the game play and playability and last ability! Heat up but shame the price is not on the Switch platform. Problem with this game is that it turns out i'm nostalgic for the console versions, not the arcade. So while they have better sound and graphics something feels off to me. Still some stock in store, picked up 2 RYU mugs in the Oldham branch. Aw they're awesome! I would definitely buy those :) Chun-Li there as well (I saw off all foes with her, back in the day). Ditto. Great mug and glass. Love that they're pixelated like the original game. Yeah he wasn't exactly writing a dissertation for Oxford. Those moments simply can't compare to criticising someone's appalling lack of punctuation on a shopping forum. Nice price .. if I didn't already own countless versions of essentially the same game, I'd be on it! Heated with a yoga flame (or a red fireball if I'm glitching out)! 3/4 size cab these. 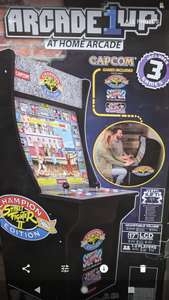 Deffo quality issues print (usa folks get free replacement artwork under warranty as known issue) and seems the sounds off on the SF2 cabs (board emu issue) so at a rrp...bit of a steer clear, but as price drops, it deffo gets interesting. Ideally i'd want £150mark and then mod it to house pi, swap out for sanway controllers and prob clear coat or clear vinyl the artwork so stays pretty. The artwork and screen on these are really nice and allot of potential at right price! Some great rep cab designs....sf2/final fight win for me, but latest mortal kombat looks very slick too. 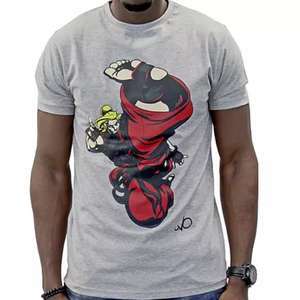 Anybody managed to get a good deal for this? I don't mind paying up to about £200 for something like this. But when that gamestop in Ireland are selling these for 170 odd euros, and most shops wanting £400 here that's just stupid.. Even in the US I've heard some able to find them at 150-200$. £400 is just way too much, especially when you could get a premade one from eBay for another 100 or so. Too bad i can't seem to find any parcel forwarders in Ireland. I'll probably wait for a good sale where they're easy to source or get delivered. Still wouldn’t be cheaper and I don’t count my hours worked at £0 per hour. One of my GoT glasses have turned up cracked. Now they're OoS so can't replace (mad) Good thing I ordered 2 sets. Beware Debenhams ordering. I recently ordered some stuff online, put the available items in my basket, added another thing and went to checkout 4 mins later. Although in my basket the items had since sold out. You must have missed the countless Debenhams posts over the last week. Nice deal if in need of a gift. First time I've seen it too! Really? I've never come across it before... strange. Cheers OP.